Time for some micro. If we go back to the Frey and Osborne job destruction chart (see my post here for a more detailed explanation), we can see that the Sales and Related (the red) category is one of the first to get crushed (click for larger image). But internet shopping, along with Semi-Automated Customer Activated Terminals (SACATs) telling us that there is an “unidentified object in the bagging area”, have been around for well over a decade. 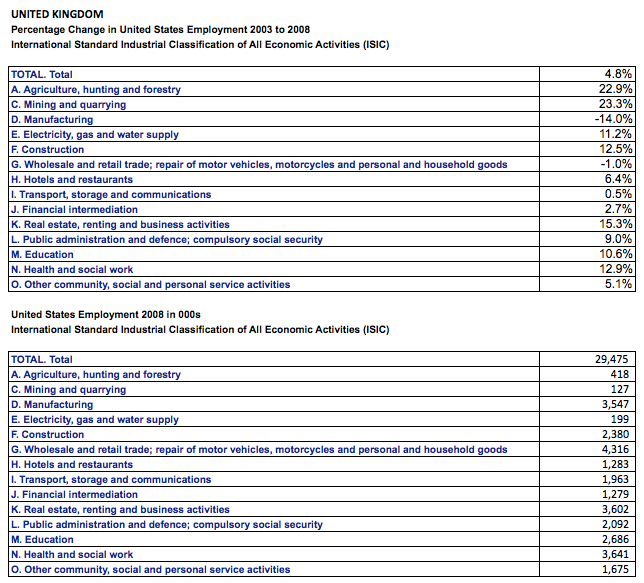 To get a sense of what has been going on in the US and UK you need a comparable data set, and the International Labour Organisation (ILO) is the place to find it (here). The three worst-performing employment categories were agriculture, manufacturing, and wholesale/retail, all showing declines against a 5.5% rise in US employment as a whole for the period. 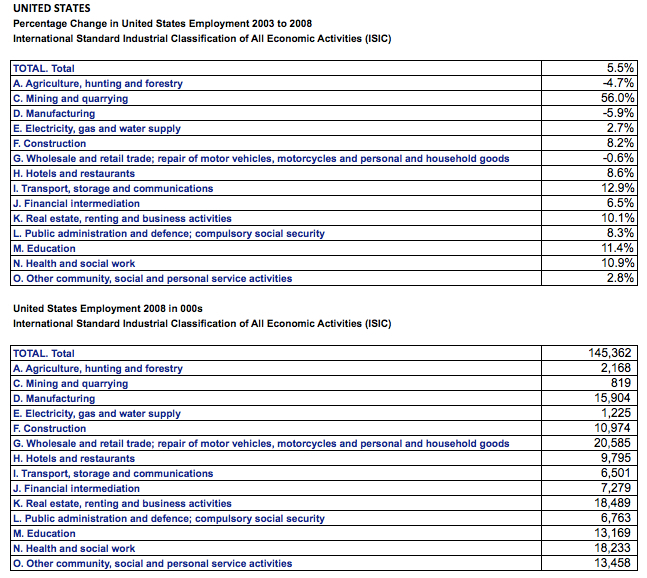 Incidentally, wholesale/retail is the largest employer in the US: 20.6 million of the 145.4 million Americans in work in 2008, or 14.2% of the employed workforce. And the UK: ditto (click for larger image). Retail/wholesale shrank by 1%, only beaten by the incredible 14.0% slump in manufacturing employment. Where I live in the UK, they have become ubiquitous, although there do exist certain national brand supermarkets that don’t use them. Nonetheless, Semi-Attended Customer Activated Terminals (SACATs) are still relatively basic in functionality and can only replace a part of what traditional cashiers do. So let’s break down the job of a cashier into parts, and then think about which bits existing SACATs are replacing and which parts the new generation of SACATs will be able to replicate. 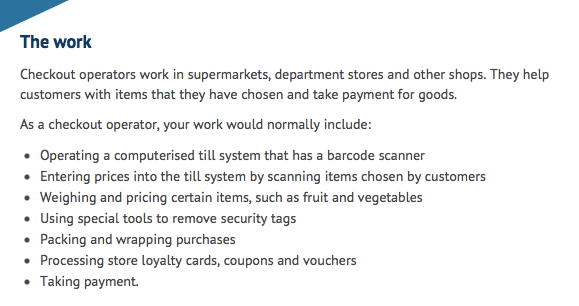 The cashier job description from the UK National Careers Service. To this list I would add the vetting of purchases of alcohol to see that the purchasers comply with age restrictions. If we look at this list, we can see that old-style SACATs can only really do bullet point 2 and 7, and partially 6. Moreover, the customer is roped into performing bullet point 1 and 5. 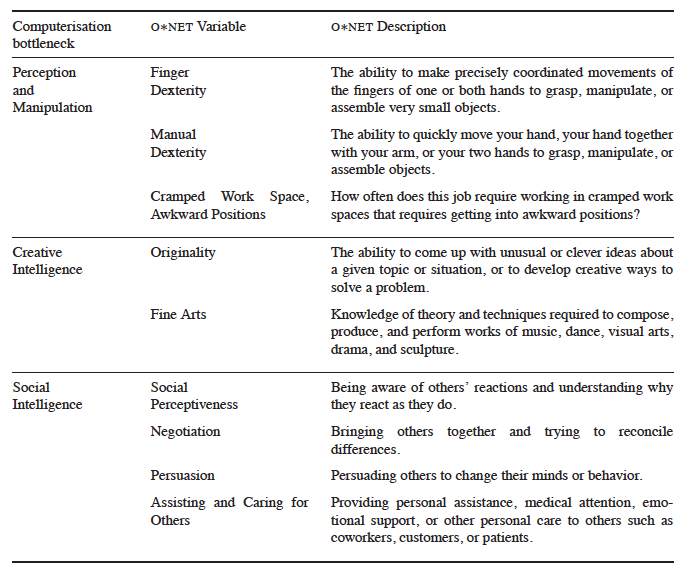 It’s actually a quite limited repertoire and stems from the bottleneck variables in the Frey and Osborne paper, in particular finger and manual dexterity (plus visual perception, which they don’t include). The SACAT has no manual dexterity. It co-opts the customer to pick up irregular-sized groceries and present them to the machine with the bar code in the correct position. Incidentally, bar codes technology has, in itself, eliminated the finger dexterity required to input prices into a cash register. 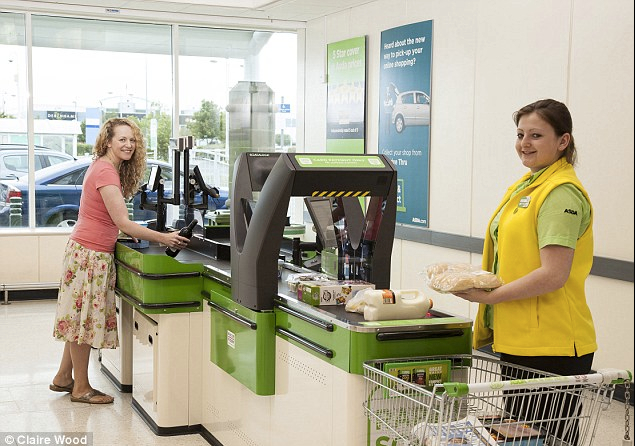 However, a 360-degree checkout called Rapid Scan, currently being trialed by the supermarket operator Asda in the UK (here), makes the need for the customer (or cashier) to jiggle each good redundant and is three times faster than traditional hand-scanning approaches. Such visual perception issues don’t show up in In the Frey and Osborne chart of technology bottlenecks above, perhaps because they think the technology is already there. However, while the visual perception of the Google self-drive car may be better than that of a human’s, it certainly isn’t at a price point ready for mass deployment. What’s so cognitively demanding about supermarket checkout? I spoke to several former checkout people, and they all pointed to the same skill: Identifying fruits and vegetables. Some supermarket produce is tagged with small stickers carrying product-lookup codes, but a lot of stuff isn’t. It’s the human checker’s job to tell the difference between green leaf lettuce and green bell peppers, and then to remember the proper code. “It took me about three or four weeks to get to the point where I wouldn’t have to look up most items that came by,” said Sam Orme, a 30-year-old grad student who worked as a checker when he was a teenager. Another one-time checker, Ken Haskell, explained that even after months of doing the job, he would often get stumped. “Every once in a while I’d get a papaya or a mango and I’d have to reach for the book,” he said. 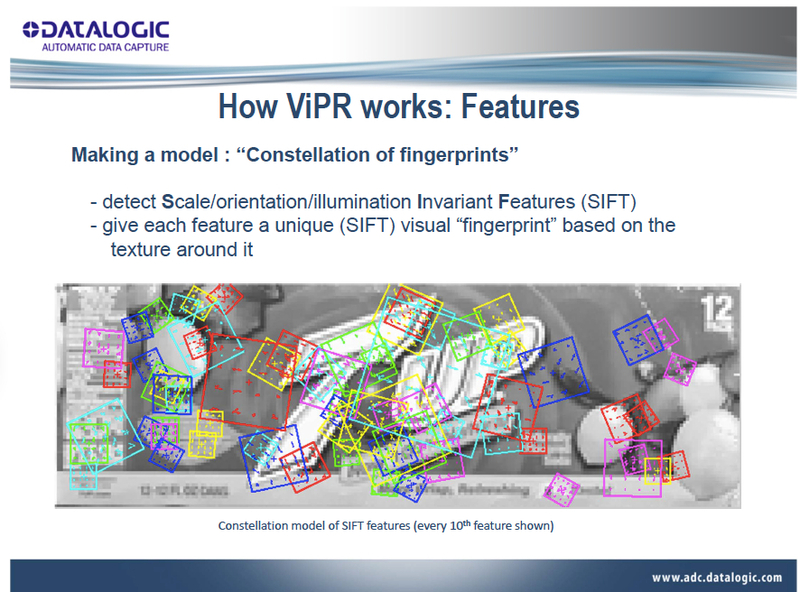 But out of Datalogic, we have just seen the market rollout of checkouts with Visual Pattern Recognition (ViPR) that can identify items without a barcode. Intriguingly, this checkout incorporates machine learning (ML). It has a hit rate of around 98%, with the 2% of unidentified object requiring recourse to a human operator. However, when identified, the image and the object go back into the database, improving the identification of all such machines in future. Unlike a visual recognition system, a system using X-ray fluorescence utilizes the chemical makeup of the item or produce being tested for recognition. The problems in visual systems associated with attempting to interpret variations in color, texture and size are minimised …. because the X-ray fluorescence system analyzes a fixed chemical composition. For example, kiwi has distinctly different chemical makeup from that of a potato, and so the X-ray identification process that utilizes the chemical makeup for identifying a product can be quite precise. Further, effects of ambient light and other visually sensitive environmental factors become less of a concern and less intrusive into the object recognition process. As an additional advantage, the FIG. 12 system can make it possible to recognize and characterize a paper bag with produce in it, in which case there is not a need to take the produce or other items to be recognized out of the bag to be identified. So not only can we now identify the difference between a kiwi and a potato, we can do it without taking the items out of their paper bag! Human operator: beat that. In the U.K., Tesco Plc (TSCO) is installing face-scanning technology at its gasoline stations to determine customers’ ages and gender so tailored advertisements can be delivered to them on screens at checkouts. OK, let’s think about money. A pod of old-style SACATs (4 terminals) costs around $60,000, but, as with all such technology, I expect the cost to rapidly decline. I have no idea what the depreciation schedule is for a SACAT, but in line with similar equipment I would guess it is 4 years. Taking a straight-line depreciation, you would be expensing a pod at $15,000 per annum. On top of this, we have to take into account the weighted average cost of capital (WACC) to purchase the original equipment. For Walmart, it is 6% (here). So that’s another $3,600 per annum. Let’s round the whole package up to $20,000 (there will be some maintenance costs in there as well). We can now create an efficiency equation to find out at what point the SACAT pod is in equilibrium with human cashiers (that is the point at which the status quo, ratio of SACATs to human cashiers, continues) remembering that a pod has four checkout points (so we are equating hours of SACAT lane availability with human availability in term of dollar expense). Using the numbers above, the human cashier is 21 times as efficient as the SACAT, or the SACAT is only 5% of the efficiency of a human. Here I mean ‘efficiency’ in the broadest possible term—not just speed of processing a bunch of groceries. The number incorporates the ability to identify a banana, help put irregular-sized objects into an annoying plastic bag whose top doesn’t open, deal with special offer vouchers of increasing complexity, spot dodgy shop lifters, ask whether the bearded-teenage trying to buy a beer is really over 18, get a plastic security tag off a bottle of vodka and ask a cashier to work extra shifts on a busy Friday evening but not come in on a Monday afternoon. Perhaps this is why SACATs have stalled the growth in cashier numbers, but not really reversed the number. Nonetheless, we are only at 5%! And Datalogic and its competitors are hell-bent at taking the SACAT into the other 95% of functionality currently occupied by humans. In my next post, I will leave SACATs briefly and jump back to macro to see how economists have been struggling to explain developments in the labour market in the face of technological change over the last decade or so. After that, it will be back to SACATs to ask who benefits from them and how their installation, and other technologies like them, can dramatically change the shape of an economy. And, finally, I will ask: what is to be done? 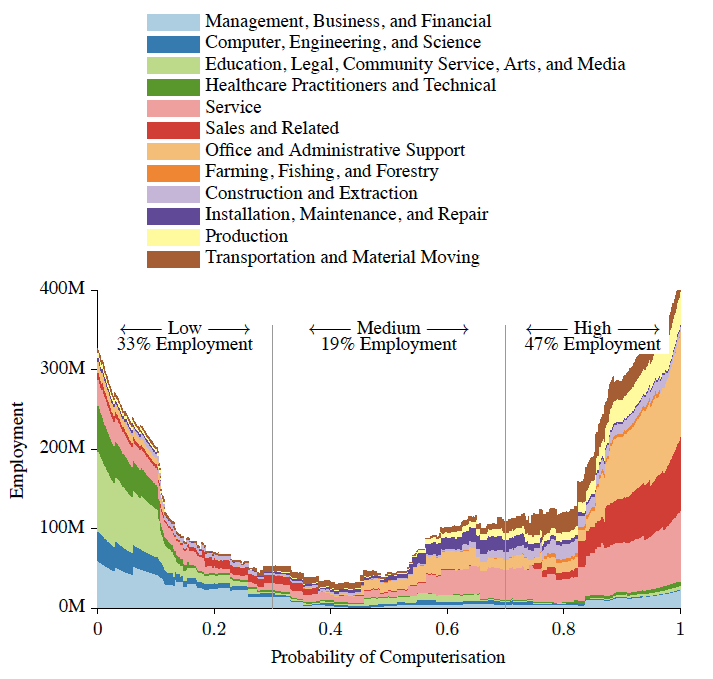 This entry was posted in Post Growth, Technology and tagged automated checkouts and jobs, Frey and Osborne, SACAT, technology and jobs, The Future of Employment: How Susceptible Are Jobs to Computererisation. Bookmark the permalink. Hmmm. Are you suggesting SACATs as a new trajectory? Bar codes did away with warehouse staff and pricing guns (and sodding labels falling off frozen foods), supermarkets did away with… Is the story as much home delivery (labour intensive? ), coffee shops (ditto?) SACATs permitting 24-hr opening, the role of supermarkets in squeezing inflation out of the system? I guess the Robert Gordon angle would be “what happens now the investment splurge of supermarket expansion is complete”. What ever happened to the prospect of RFID tags that were so tiny they could even fit in a fruit labeling sticker (as well as every other package in the store)? One could then just push one’s cart past a reader and get the itemized total for all items in the cart. Joe: When I was in Japan, RFIDs were a hot investment theme, but you are right: I haven’t heard any talk about them for a while for some reason. They do entirely eliminate the need for manual dexterity manipulating bar codes toward scanners, so when (if) this technology matures it should have a big impact on cashier employment. Mathew. Yes, it is a story about the internet and home delivery, but if you look at the stats that trend should show up in aggregate employment in retail as well as cashiers. The gains, conversely, will be coming in transport. 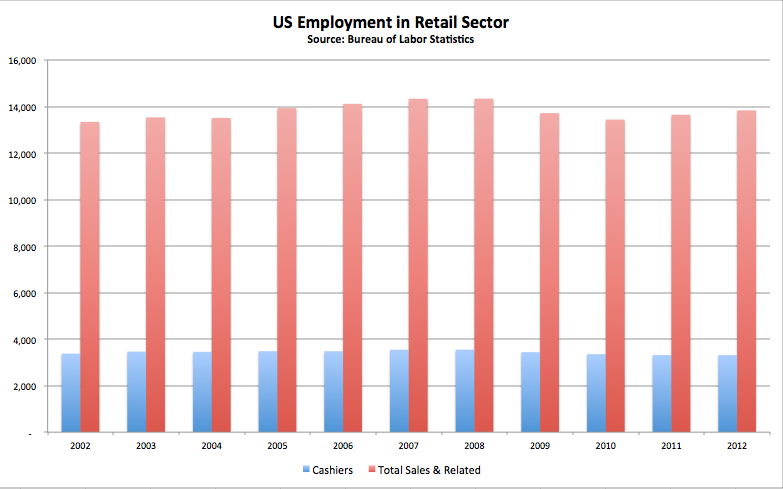 But the numbers show overall retail employment diverging from cashiers. I don’t think the investment splurge by supermarkets has even started. Current SACATs are so basic, you have a massive opportunity for upgrades to eat into those functions currently occupied by humans. A $60,000 investment in a pod is peanuts given turnovers. I’ll come back to that later. This will also prove a deflationary force; although I think the cost of goods sold (COGS) in terms of food raw material will provide lots of downward friction due to high energy costs and increasingly climate change. COGS for Walmart is 75%, Tesco and Sainsbury’s are even higher at over 90% (some of this difference may be due to different accounting practices, but these numbers are still very high). Excellent article. 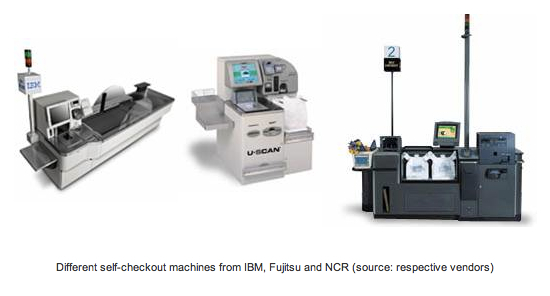 If you are interested in the pros/cons, cost and new options to improve the checkout experience compared with self checkouts, a series of three relevant white papers may be found on our website: http://bit.ly/JCpBLU. You may be surprised when seeing the full picture. Kay. Thanks for the heads up on your reports. Interesting to see your costings for cashier supervision of SACATs. I need to incorporate this in my back-of-the-envelope numbers equating SACATs and cashiers above. You also bring out the complementary factors between SACATs and cashiers and the efficiency of human cashiers in terms of throughput. In some way, I am surprised that the technology has progressed so slowly given the size of the potential market. I am glad you could get some useful information from the reports. Part-III of the HybridCheckout white papers may be downloaded from the below link. This last report of the series goes more into details regarding the actual costings and performance figures. In general I think the typical grocery, DIY or supermarket checkout is way to complicated to be performed efficiently in SACATs. Still, some purchase with a few number of barcoded items may be performed in a satisfactory way for some groups of customers in SACATs. Thereby providing the customers an alternative to facing the cashier, as preferred by some customers.